It was Christmas 2011, our first Christmas together in Bangkok and with an ovenless kitchen I treat Fanfan to a marble filled steak dinner; with mashed potato, boiled veg, stuffing, and gravy on the side. One bite and no… she can’t eat it. This was no doubt the easy option for Christmas dinner yet Fanfan was far from impressed. While for many this would ruin Christmas, for me it was the best Christmas ever. Two steaks for dinner. Anyway, since then I’ve been trying (and mostly failing) to find the best steaks in Bangkok Sukhumvit area. While we have far from tried them all to date we did manage to create some success stories and we’ll continue to update them as we go along. 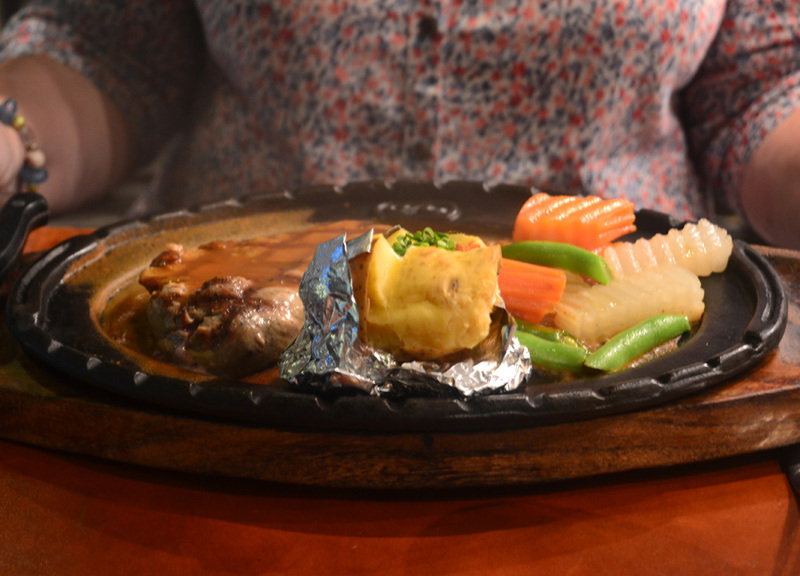 For a homegrown steak experience it is hard to look past Chokchai Steakhouse. Better known for their tourist farm in the Khao Yai region of Isaan Chokchai also have a number of steakhouses dotted throughout Bangkok. As expected the local (Isaan) steaks are the cheapest and as expected they don’t really compare to the common Australian imports found throughout Bangkok. So their menu does include various additions of imported meats including lower grades of Australian Wagyu. The farms just just as famous ‘Umm! Milk’ dairy outlet also sits next door and the Steakhouse includes them in the ice-cream and dessert menu. Chokchai Steakhouse is found on the small soi linking halfway up Sukhumvit 21 (Asoke) to Sukhumvit 23 at Prasarnmit Plaza mall. Prices start around 450 Baht for local steaks which rise to around 1,200 for imported prime cuts. We would probably eat at Wine Connection more regularly than any restaurant in Bangkok, before they had steak. Now that they serve steaks it is all Fanfan orders. Wine Connection is perfect for the frugal Wine and Dine experience. While they may not offer the best steaks in Bangkok they are way up there in value for money. I can’t think of any other restaurant or steakhouse in Bangkok offering an imported rib-eye matched with a bottle of wine for under 1,000 Baht (not 7/11 wines). Despite it’s low price tag the quality of steaks are relatively high. There are three imported Australian steak options at Wine Connection; the Tenderloin, the Rib-Eye and the Sirloin. Ascending between 400 and 600 Baht. Steaks are available at both the Sukhumvit 26 and Rainhill locations but not at Sukhumvit 22. The Fireplace Grill is set inside the InterContinental Hotel, directly next to the Chit Lom BTS Station. While technically not in Sukhumvit it is just one further stop along the Sukhumvit line. This place is a must for the steak aficionado hosting a simple menu of high grade, and of course delicious steaks. All steaks are imported including many Kobe and Wagyu cuts. They also offer many more classic and contemporary cuts and other steak house favourites including Tomahawks. As expected prices are more than the Sukhumvit corner steakhouse but the dining experience is worth it. Prices start from around 800 Baht (Marble 4 Wagyu) and up to around 4,000 Baht (Marble 8 Wagyu) the highest marbling we’ve found to date in Bangkok. Fireplace Grill is steak heaven.